Brimming with atmosphere and edgy suspense, The Rebel Wife presents a young widow trying to survive in the violent world of Reconstruction Alabama, where the old gentility masks a continuing war fueled by hatred, treachery, and still-powerful secrets. Augusta Branson was born into antebellum Southern nobility during a time of wealth and prosperity, but now all that is gone, and she is left standing in the ashes of a broken civilization. When her scalawag husband dies suddenly of a mysterious blood plague, she must fend for herself and her young son. Slowly she begins to wake to the reality of her new life: her social standing is stained by her marriage; she is alone and unprotected in a community that is being destroyed by racial prejudice and violence; the fortune she thought she would inherit does not exist; and the deadly blood fever is spreading fast. Nothing is as she believed, everyone she knows is hiding something, and Augusta needs someone to trust. Somehow she must find the truth amid her own illusions about the past and the courage to cross the boundaries of hate, so strong, dangerous, and very close to home. Using the Southern Gothic tradition to explode literary archetypes like the chivalrous Southern gentleman, the good mammy, and the defenseless Southern belle, The Rebel Wife shatters the myths that still cling to the antebellum South and creates an unforgettable heroine for our time. Why did I read this book: In case you haven’t noticed I have been on a historical binge for the past few months. This one looked good, I heard good things about it not to mention I have recently read The Freedom Maze and LOVED it and wanted to read more books with stories about the Civil War – before and after. The Rebel Wife opens with Augusta “Gus” Branson observing her husband Eli dying of a fever. Their marriage had been arranged by her family, prompted by the loss of their fortune in the aftermath of the American Civil War. Eli was 25 years older and a Union sympathiser – their marriage might have saved her family from ruin but his Northern connections as well as his fight for African-American rights set them apart within a community that is mostly white and proud. Though they had been married for ten years and had a son, there was never love between them and Gus sees Eli’s death for what it is: her one chance to be free and rich. Unfortunately for Gus, things don’t go as planned. She learns that her kinsman Judge is the trustee of Eli’s estate and in charge of his money and effectively of Gus’ life. Worse even than that, he tells her that Eli’s money is gone and all of a sudden Gus finds herself at the beck and call of her kinsmen and destitute. But things are not as they seem: Simon, an ex-slave and her husband’s associate tells her there is money, a fortune hidden somewhere, money Eli used to bribe politicians. Unsure of who is telling the truth, what to do, Gus starts to become aware of her surroundings and to slowly trust Simon, despite the admonishing of her family and friends. They must find the money before her family does and soon – because Eli was only the first person to succumb to the mysterious blood fever that is starting to spread. 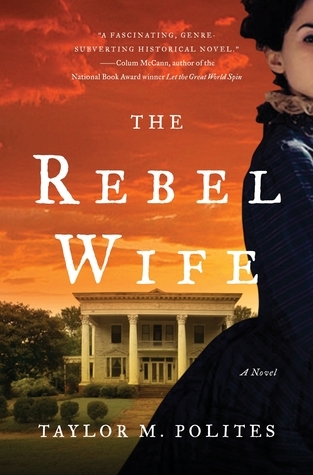 Through Gus’ first person, present tense narrative The Rebel Wife is a vivid, complex portrayal of the Reconstruction-era South. The story has a few elements of mystery with Gus and Simon trying to find what happened to Eli’s money but this is really a character study on the evolution of a woman who had been living in a limbo for the past ten years. It is strange how much of a wakeup call Eli’s death seem to be for Gus. As the story progresses, we see just how passive, ignorant, unaware she had been up to that moment. What had she doing all through those years that she didn’t know how much money they had or how her husband made his living? How could she be so oblivious to her surroundings? I found Gus fascinating: from her obliviousness to her denial; her dependence, the only role she thought she could play out of duty and because that is – supposedly – the place of women. Until the dream of becoming independent became possible with her husband’s death but given how that is soon taken from her, she starts to question everything: not only the expectations about her gender but also racial. As a white woman surrounded by former slaves her discourse is often entitled, patronising and racist. Her first impulse is always to scold and to expect things from them and she avoids even touching her employees – even if she relies more and more on them. One of the key moments in this novel is perhaps when Gus realises that her marriage was nothing but a monetary transaction: she was bought by Eli and sold by her family. In the midst of all the rage and hurt she realises that she is not alone in that – her companions, her employees all know what that feels like, and much worse. Her growing reliance and trust on Simon, and the subtle signs of the romantic development of their relationship is beautiful. Unlike what the title might tell us, Gus is not really a rebel and her narrative is quietly contemplative. She avoids confrontation whenever she can and plays the cards she knows to play – more often than not she gets what she wants by faking tears in front of her kinsman. I loved this about Gus, I loved that she didn’t completely change personality when she changed her frame of mind. Although her actions in the ending were a little bit too extreme, I also felt that they fit with the things she had learnt. I loved that she even found things to admire in her husband. From a setting perspective, the portrayal of a broken South is fascinating. I felt the author captured really well the moment: the ruined families, the politics, the complex racial relations not to mention the horrible growth and appearance of the Knights of the White Cross and Klu Klux Klan in the context of an attempt to institute the Civil Rights Act – which effectively and shamefully, took 100 years to be fully enacted. The African American characters were beautifully written as well: with depth, complexity and variety. There was not ONE unique African American voice but several. And even though Gus is the protagonist she is not a White Saviour either. If I have one major complaint it would be that the villains are perhaps too villainous. It was far too easy to pinpoint and abhor the villains with their obvious hatred, sexism and bigotry. I think they lacked subtlety and complexity as unfortunately, bigotry and sexism are often insidious and multifaceted. Ultimately, The Rebel Wife is a great historical read and is certainly a notable read of 2012. I know there were white folks who tried to be good to their people under slavery, but there ain’t a way you can be good to someone when you’re taking things away from them. And that’s what slavery was, people taking things that weren’t theirs. Their work. Their bodies. Their love for themselves. And we’re free now, all of us. I have heard a lot of good things about this book. I have it out from the library at the moment. Just have to find time to read it. An ARC for this is sitting on my bookcase and it’s on my list to read in April. I love Civil War novels and grabbed this one right away. Now I just have to read the darn thing. Thanks for the review. If you haven’t read The Healing you should!